Yes, there is an asteroid named Ida, and it is an extravagant shape, so extravagant that, thanks to Tayfun Oner’s computer wizardry, you’ll benefit from having some ribs to pack inside the folded object, helping hold its shape. Cut this out and get in touch with Ida. Note: I goofed in one place, near point “n.” If you fold this one up, it won’t close perfectly at “n.” It’s not you; my geometry slipped. Here’s how it looks folded up, without internal ribs. The image on the left exists in the digital world. Tayfun (or anyone with a fancy CADCAM machine) could make you an actual object from the digital file, but then it wouldn’t have the photomosaic on it. And it would cost a whole lot more than the one on the right. 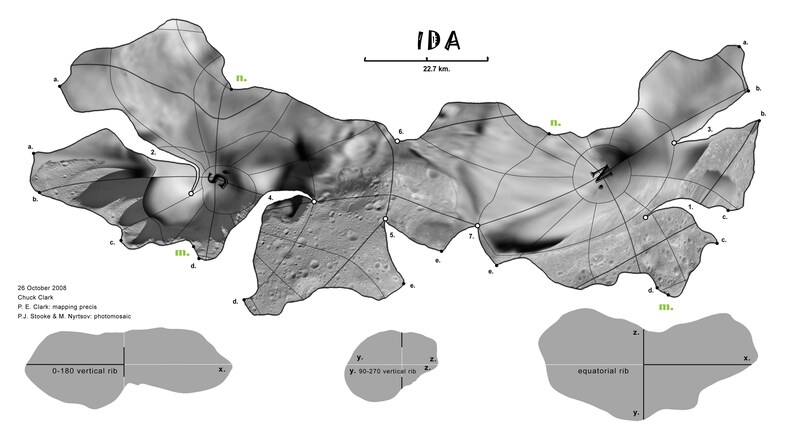 Ida Computer Image vs Folded CSNB map.